Presidential candidate of the Peoples Democratic Party, Atiku Abubakar, National Chairman of the party, Uche Secondus, and governors elected on the platform of the party met in Abuja on Monday night to consider strategies for the forthcoming elections. Also at the meeting were Atiku’s running mate, Peter Obi, and 29 governorship candidates of the party for the 2019 elections. Recall that governorship elections would not hold in the seven states of Ekiti, Osun, Ondo, Anambra, Bayelsa, Kogi and Edo in 2019. The meeting started around 10pm and ended in the early hours of Tuesday. Secondus, who presided over the meeting, was said to have told the attendees that the meeting was to discuss strategies that would enable the PDP to defeat President Muhammadu Buhari and his party, the All Progressives Congress. Sources at the meeting also said Secondus presented for discussion the outcome of the by-elections in Katsina, Bauchi and Kwara states held on Saturday, which was won by the APC. It was gathered that participants at the meeting unanimously condemned the outcome of the elections, claiming they were rigged for the APC by the Independent National Electoral Commission in connivance with security agencies. 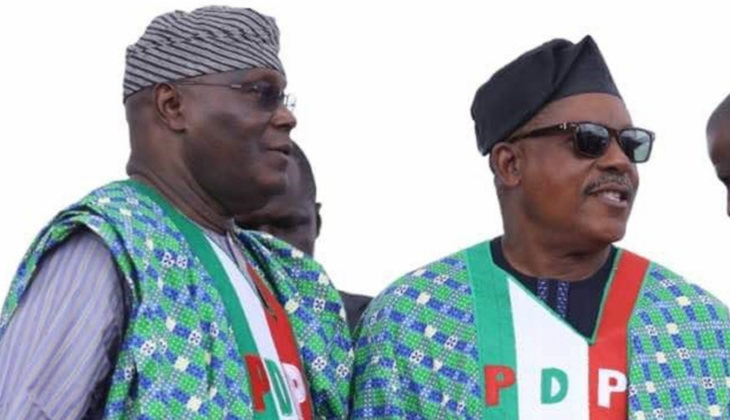 A source at the meeting said Atiku and Secondus sought the cooperation of all the members of the party to enable the party win the election. “Our chances are bright, even though we are going to confront a vicious government and unpretentious riggers,” Secondus was quoted to have said. Both men were also said to have directed the candidates to work with leaders in their areas from the ward to state levels. Secondus, later confirmed the decisions taken at the meeting, saying, “The meeting was aimed at appraising our preparations for the general elections next year. “The interaction was to foster harmony among all and also to know the challenges in states.